We sometimes get that amount of page views in an hour, these days. 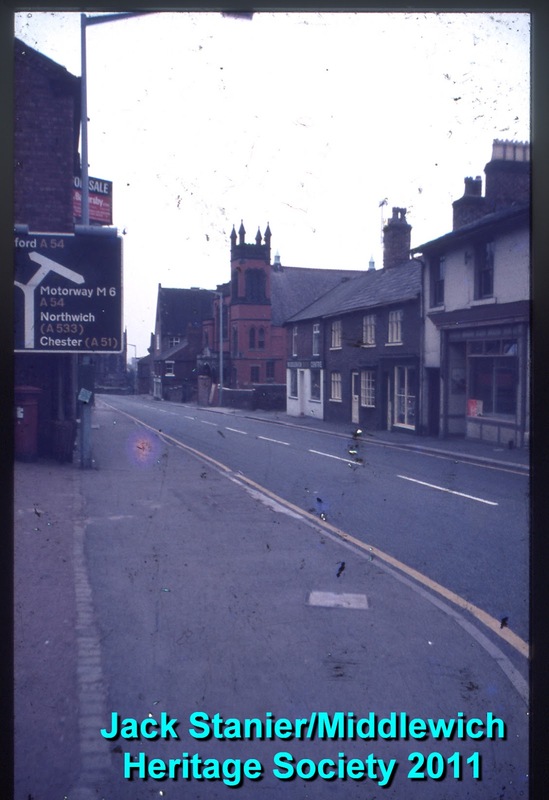 But our awe and wonderment still stands, when we think about the number of people taking an interest in our 'mean old town without any manufactures' as it was described by Dr Johnson, quite possibly the founder member of the Keep Middlewich Miserable Campaign. We continue to be grateful to everyone who takes an interest in The Middlewich Diary and, indeed, in the town. Blogger, the company which provides the platform on which our Middlewich Diary is based, provides statistics on a daily basis showing us which diary entries are being viewed, by how many people, and in which locations. At 1pm on Sunday 4th March 2012 there were 163 viewers in the UK, 25 in the USA, 20 in the Ukraine, 17 in Germany, 8 in France, 8 in Sweden, 5 in Russia, 4 in Australia, 4 in Brazil and 3 in Argentina. Page views per day are around 200-300, which is very good indeed for a specialist interest blog like this one, and just goes to show the immense power of the internet. Probably of more interest are the Top Five most viewed Diary entries since we started last June. This is the state of play as of 1pm on Sunday 4th March 2012. LEWIN STREET 1973 by Jack Stanier (820 views). I'm not sure quite why this particular entry should be so popular, but it consistently appears at the top of the list of pages people are looking at. The original photo was filed with the title LEWIN STREET 1970, but the fact that the old Seddon's Workshops had disappeared by the time the picture was taken caused a change of mind. There was some speculation about the accuracy of the road sign on the left (or, more precisely, the way in which the road layout is depicted on it - the sign is - or was - accurate enough, but we concluded that it was to be regarded more as a diagram than a map. Considering such points is how we spend our days. MIDDLEWICH SALT COMPANY LETTERHEAD 1946 (573 views) Taken from a letter found when we cleared out a lot of paperwork from 33 King Street, this ornate and old-fashioned piece of stationery is redolent of old Middlewich salt town days, when the town had a certain something about it - rough, unglamorous and as salty as old Copenhagen.. If you lived here in those days, you'll know what we're talking about. If you didn't, it's difficult to explain. But we try. CROXTON WATER FALL (185 views) Ah yes! Croxton Water Fall, or Croxton Weir. This entry is based on an old picture post-card showing what looks like a long-gone local beauty spot. 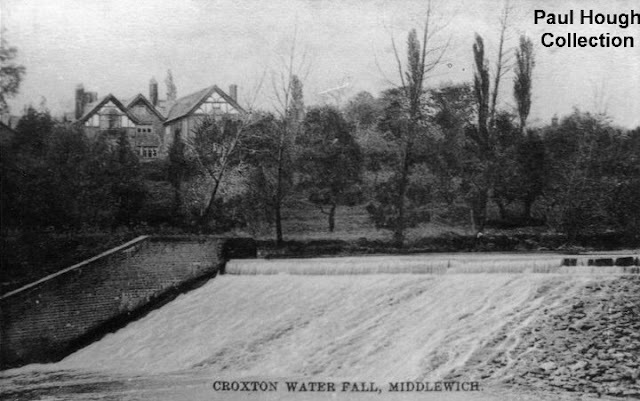 The mystery of where it was/is was solved very rapidly, but the related mysteries of just where the original Croxton Hall was situated, and why the 'Water Fall' looks so radically different from the way it did years ago have given us hours of innocent pleasure. NOW AND THEN - MANOR LODGE (152 views) Or: The Case Of the Disappearing Gate-post. This, and related entries, show this early 19th century building at various different periods in its life, including its current renaissance as a very stylish residence. One of its gate-posts has had more of a chequered career and was the subject of a Middlewich Diary Exclusive when it was pranged by a motor-car just after Christmas 2011. MYSTERY PHOTO #1 (SOUTHWAY and TESCO'S CAR PARK) (114 views) Dubbed 'mystery photo number 1' when we were looking through the Paul Hough Collection and giving each photo a roughly relevant title, it didn't stay a mystery for very long. It's the field alongside Southway where the Orchard Works once stood and Tesco now has its car park. Big changes are afoot in Middlewich in 2012, and this area will be radically transformed once more before too long. So there we are - the five most popular Middlewich Diary postings - so far. 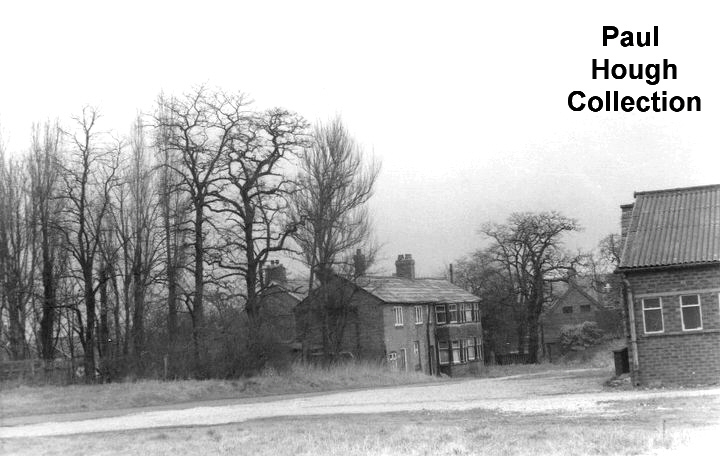 We hope you'll stay with us as the story of Middlewich - Past, Present and Future - continues to unfold.